While I don’t disagree with celebrating love every day, I also think we should be thankful every day, but no one seems to have an issue with Thanksgiving. We should probably be doing a lot more things every day. 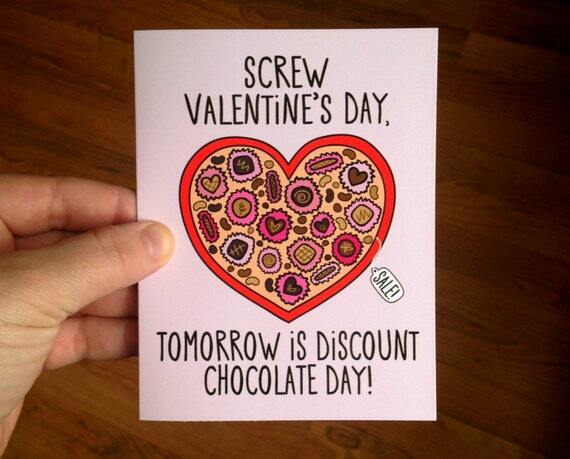 And while I’m not against Valentine’s Day I don’t do anything huge to celebrate either. Last year David make a special breakfast before work, and in the evening I made a nicer-ish dinner. I used my pink and red fiesta-ware plates and we called it a day. Before David and I were dating my mom took pretty good care of me with care packages in college and a little gift in the morning growing up. So, my Valentine’s experiences haven’t been rough. 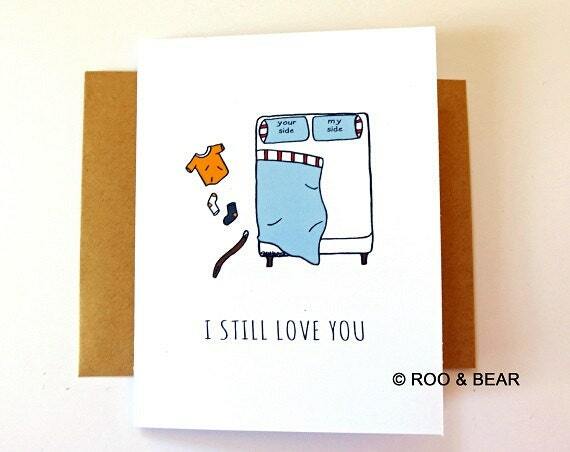 I’ve enjoyed looking through some of the funny Valentine’s Cards that Etsy has and I’m sure you’ll find them funny no matter which side you fall on the debate. 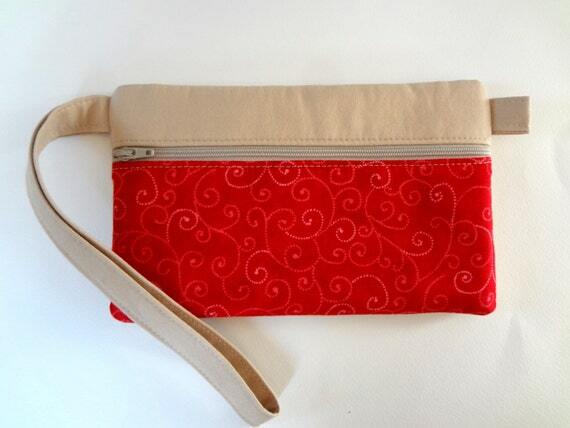 If you are into gifting for Valentine’s Day or you just want to treat yourself to something special, check out this wristlet from Bobbin and Co.
And there is a music-note inside. 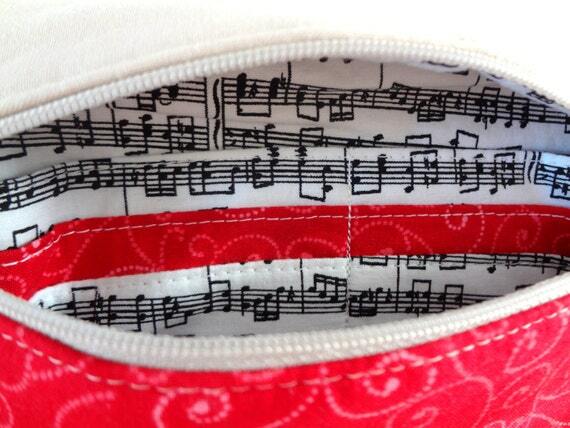 And a bonus- if you give this to a music lover, they can play the music inside. Ha! I first made a set of these wristlets for my friend Gina’s wedding (take a look at her brand new blog Mrs. Dessert Monster). I had a little leftover fabric when I was finished with her order, and was happy to put a few extra together for the shop. Happy Friday, Happy Valentine’s Day next week, or Happy Anti-Valentine’s. What are your thoughts? Love the holiday or love? Hate it? No real opinion? Let me know in the comments. Hey Readers, what’s going on? My blog has gotten a little dusty as of late, and it is high time that I check in again. First things first: A big thank you to everyone who supported Bobbin and Co. over the Christmas season. Whether you purchased an item or told me something in the shop was cute, I appreciate you. 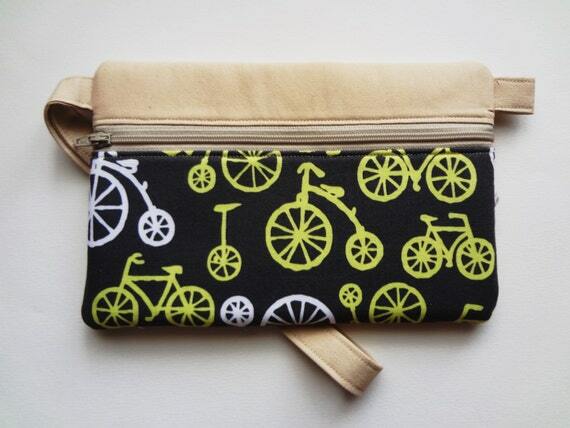 I was kept busy in December packaging orders and making runs to the post office several days a week, I loved it! In addition to a good number of sales during the season I was also doing a Heifer International promotion. 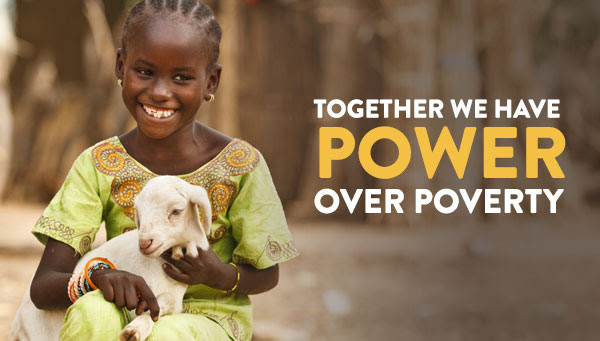 15% of the retail value of all of my November and December sales went towards Heifer International. I spent one summer in college volunteering with Heifer International, and agriculture development projects are near and dear to my heart. I’m pleased to say, that thanks to you, the shop raised $100 to donate. We were just shy of the amount needed for a goat donation, but we were able to purchase the gift of rabbits, honeybees, and 1 share of a goat. And now we’re on to another new year. I’m not one to set a lot of resolutions per se, but I am big into setting goals and working for them. I suppose its almost the same thing, I just prefer the word goal to resolution. I’ve got some goals and ideas for the shop and I would love to hear your input. 1. Develop at least 3 new items. Some ideas floating around my head right now are: a large weekender style bag, a new men’s item (grilling apron? ), and something else that uses bright, pretty fabrics. 2. Restock my shop. I’m out of the mini-makeup bags and a few of the men’s bag colors. I want to re-up the full inventory, and add lots of different color and pattern options for my existing items. 3. Participate in a craft show. I think I’d like to do this around the 2015 holiday season, I will spend time looking through the options around here and then decide if it is feasible for me. What are some other goals that you have for 2015? Is there anything you would like to see from Bobbin and Co. this year? It’s book review time again with Modern Mrs. Darcy’s Twitterature Linkup. Lately I’ve been reading more avidly than before. Hence the slower rate of blog posts, less clean home, etc. I’m going through some long ones, so I feel like I should have more to “show” for my reading time, but alas, I’ll just have to look at word counts to feel like an adequate reader. 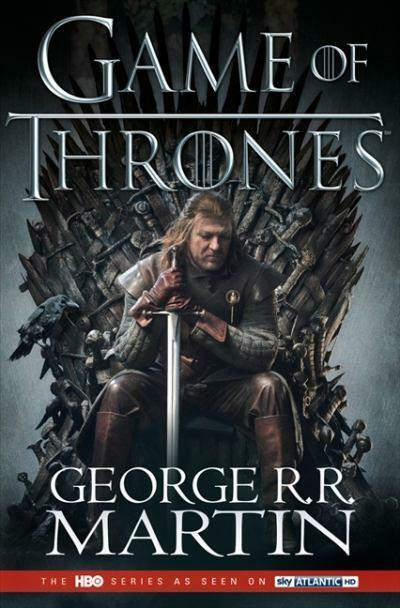 I finally made it through A Clash of Kings by George R. R. Martin. The depth and level of detail is pretty amazing and I’m hooked into the story. Only semi-complaint, these books are LONG. 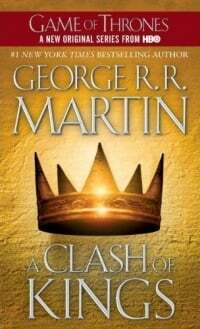 I was reading the book on my nook and wondering why I was being such a slow reader, then I saw a hard copy of A Clash of Kings at the bookstore and understood that it was much lengthier than my nook would have led me to believe. There were more differences between the book and show for this volume and it was fun to make comparisons as I read. Since I read two books in this series in a row I’m now going on a bit of a break to squeeze a few short novels in between. 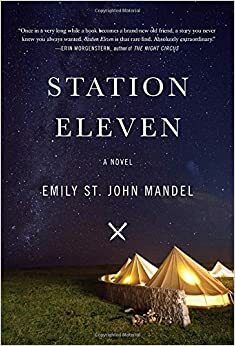 Next on the list is Station Eleven by Emily St. John Mandel. I had heard good things about this book, and it’s petty new so I was excited to be on the front end of reading it. I had heard that, yes it’s another post-apocalyptic story but you won’t want to miss this one. I did enjoy that this was a story in the post-apocalyptic genre that was for adults, it’s filled with Shakespeare, and Star Trek references, and it did a good job going back and forth between time before the deadly virus hit and the years following. While I appreciated the different points in time and eventually seeing the stories connect, there was a little too much back and forth that I didn’t quite feel like I spent enough time with any of the characters to fully appreciate them. In progress: Harry Potter and the Deathly Hallows, The Stand, and The Secret Keeper. I’ve also got a huge library stack that I’ll never get through. Has anyone read The Queen of the Tearling? The library copy had a beautiful spine and a ribbon bookmark that pulled me in. I’m trying to decide if I should make that one a priority in my tall stack of books. Dry Shampoo: Still trying to form opinions about this one. Last time I got my haircut I was told I should wash my hair less often. As someone who works out 4-5 times a week this isn’t exactly an option. She suggested a dry shampoo for workout days that weren’t quite as strenuous. I have mixed feelings. Fabric: I’m addicted and want to buy more. I’ve told myself that I’ve already purchased everything I’ll use for items to be sold around Christmas, but when I get a positive response about items I’m planning it’s hard to not buy more to prepare. English Muffins: Breakfast of choice for the last two weeks. TV: Walking Dead Season 4 and the Final Season of How I Met Your Mother are finally on Netflix. Yes, I’m a season behind. No, don’t tell me what happened. College Football: Still cheering for the Hokies, but since Texas A&M and University of Florida are also on my radar, so far at least one of my teams wins every weekend. We’ve also had a standing date to watch football with friends most Saturdays, and that has been fun to look forward to. Knitting (a little): In college I knit a ton. Then I moved to Texas, then Florida. Knitting is not quite so appealing in warmer weather so my needles have been on a break. I’m working on a little infinity scarf that I’ll probably add to the shop when I finish. This won’t be a regular shop item, but it’s been fun to pick up the yarn again. Following directions: My food processor bowl has a Max Liquid Fill line. I ignored this over the weekend to my detriment. Never again will I blow off suggestions from my kitchen appliances. 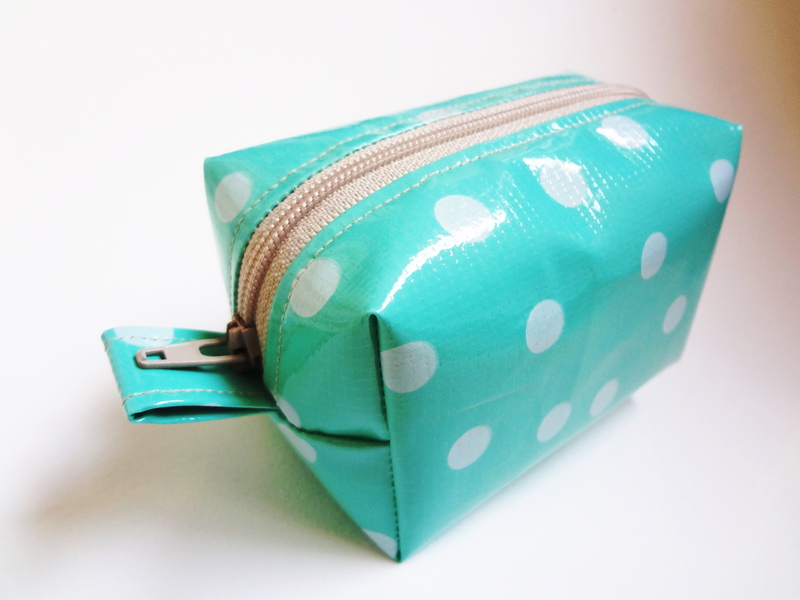 The more of these mini-makeup pouches I make the more I am loving them. 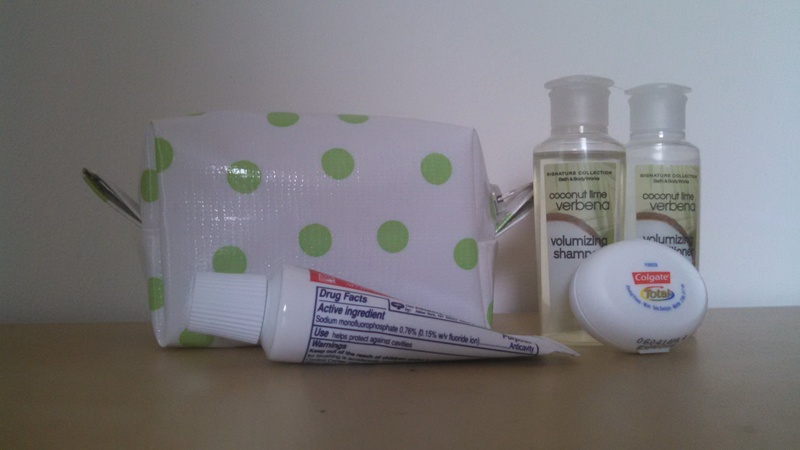 Initially, these pouches seemed like a perfect complementary item for my larger makeup bags. 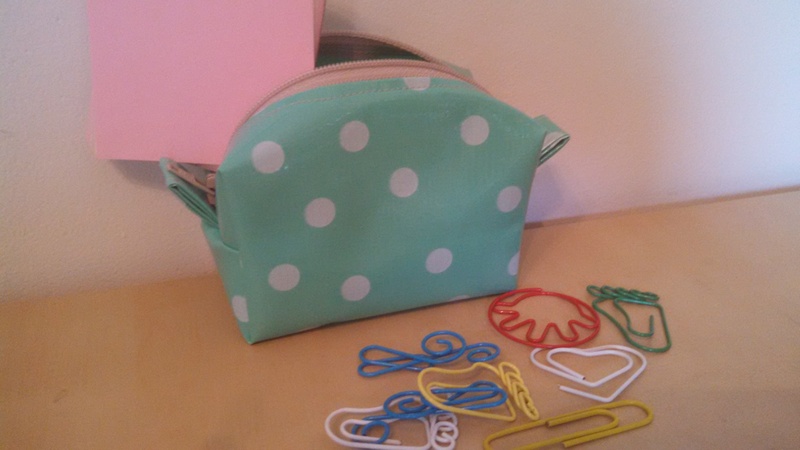 They are a simple one layer that matches the inner oilcloth of their larger counterparts and they are great for organizing a few smaller items within the bigger bag. However, the more I look at these bags, the more I realize that they really can stand on their own. For your favorite lady always ready to trot around the globe, think about gifting some travel sized items in this bag. You really can get travel sized shampoo, conditioner, toothpaste, a little bar of soap, and maybe even a travel toothbrush inside. 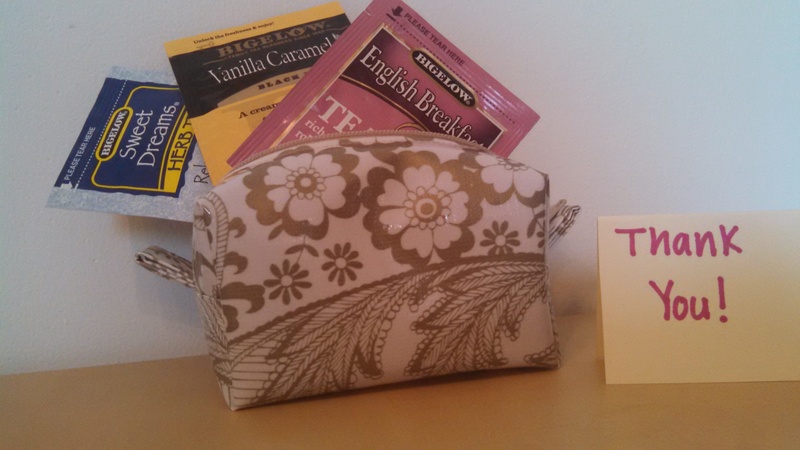 When you want to show a little appreciation for someone who helped you with a special favor, fill this bag with a few small pieces of their favorite chocolate or a selection of tea and add a little note expressing your thanks. Fill the bag with post-its, funny paper clips, or some mini-highlighters as a holiday gift for your child’s favorite teacher. These bags are the ideal size for a holding a gift card. Pair it with a small bottle of nail polish, a little necklace, or whatever little touch your friend might enjoy. 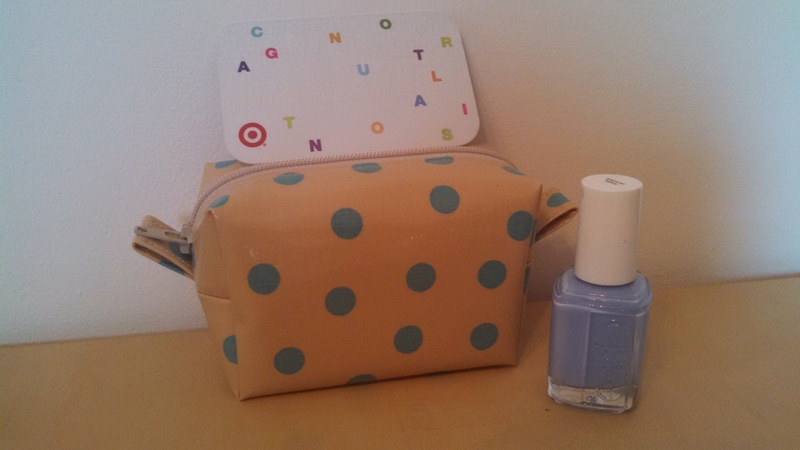 What else would you put in these cute little bags? Over the last year I’ve been listening to the Harry Potter books on audio. I’ve read all of the books multiple times, but this is my first time listening my way through the series. To say that I love this series is an understatement. 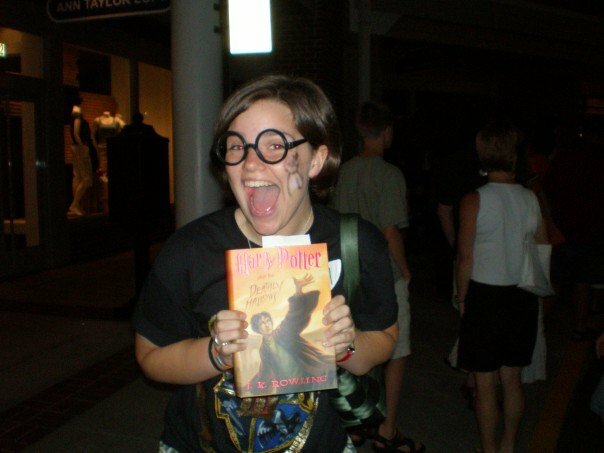 Throwback to the midnight release at Barnes and Noble when I got the 7th book. 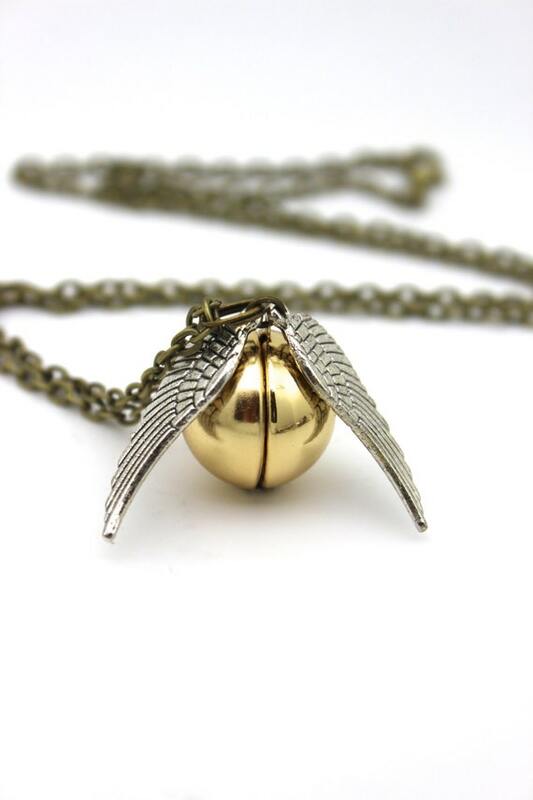 There are a lot of Golden Snitch jewelry options out there, but I like this locket option from Pretty Little Charms UK the best. You’ll find other items for your favorite fiction series at this shop too. 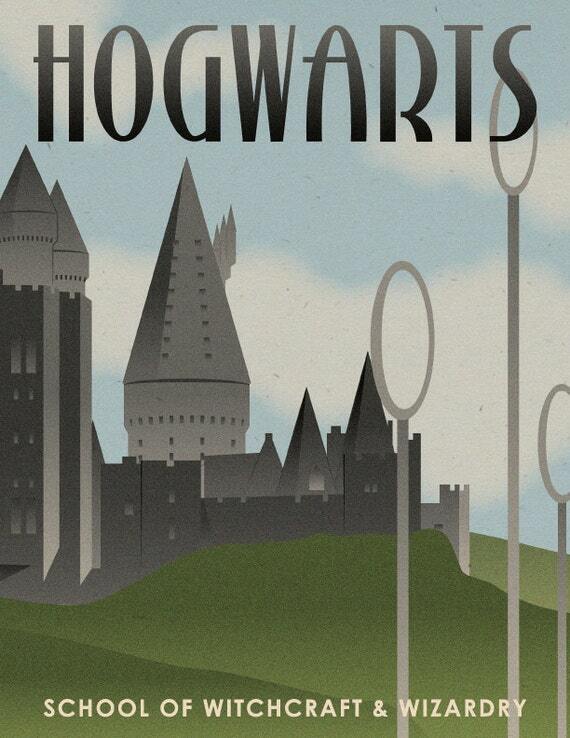 I’m loving the creative take of the Harry Potter vintage travel poster from 716 designs. Now, to convince my husband that we need to have a Harry Potter themed home. 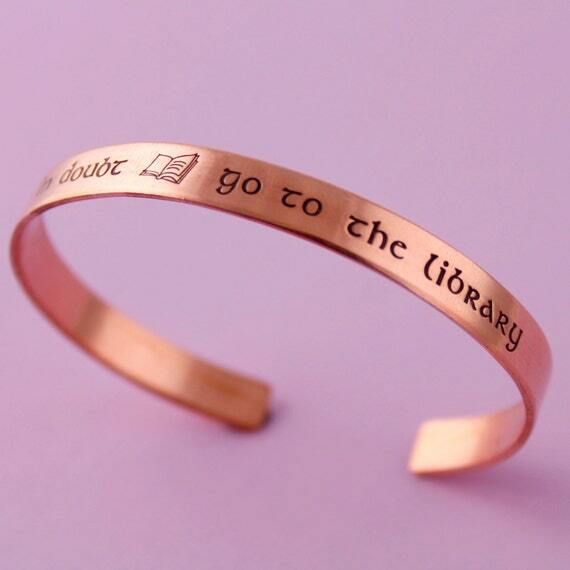 This “When in doubt, go to the library” bracelet from Spiffing Jewelry says it all. 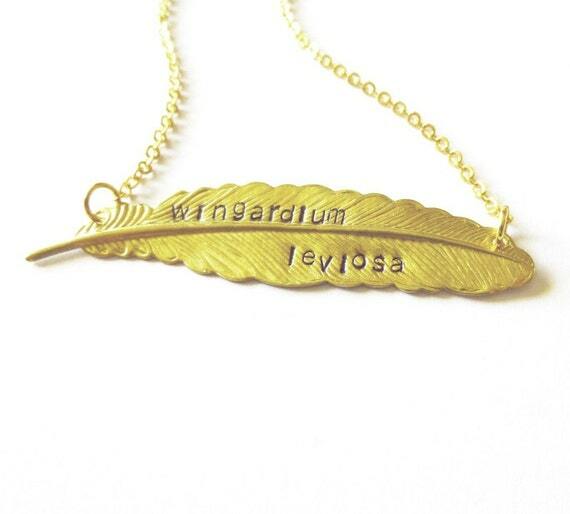 What I love about this necklace is that at first glance it could pull off as a cute little piece that would stand on it’s own, but upon closer inspection you get the “Wingardium Leviosa” spell and a happy connection with Potter fans everywhere. Find other elegant pieces from Dreams by the Sea. 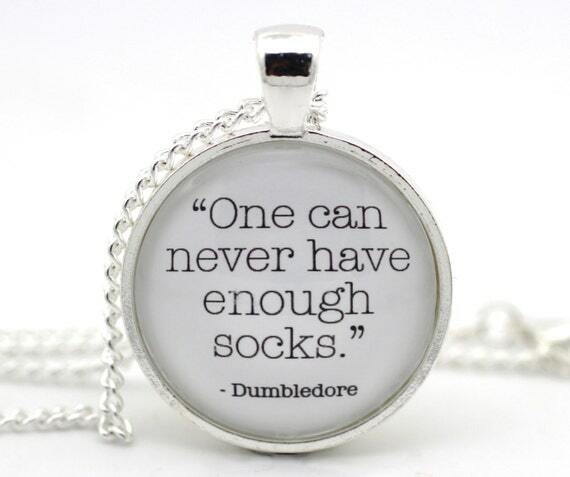 Socks are my favorite article of clothing (even though I don’t get to wear them as much as I want living in Florida) and I couldn’t agree more with Dumbledore’s statement. Find this necklace and similar others at Beneath Glass. This month seems to be the month of in-progress books and only the long ones. 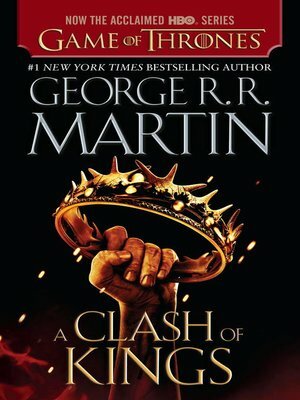 Right after the last Twitterature with Modern Mrs. Darcy I finished A Game of Thrones by George R. R. Martin and then followed it up immediately with starting the next book in the series: A Clash of Kings. I’m not quite halfway through. I’m certainly liking this series, it just takes a while to read. In more exciting news, I figured out how to read while running on the treadmill. While reading through this series I’ve set my nook to a gigantic font while running and it has revolutionized treadmill time. The nook covers up that annoying circle that tells you how far you’ve gone in a quarter mile. Still working out how to read (without an audio book) while running outside. Continuing with the long book trend, I’m listening to The Stand by Stephen King, it’s a story about a killer virus and all the events that follow. I’m doing a combination of audio and reading the hard copy for this one, mostly audio. Unfortunately it was due at the library and someone else had a hold on it. Alas. It would seem that this particular book will be a longer term project because it will certainly take a few library checkouts before I can finish it. Can’t wait for my hold to come up again! In between listening to to The Stand I’ve got Harry Potter and the Deathly Hallows by J. K. Rowling going on an audio book as well. Harry Potter (like the rest of the world) is one of my top favorite book loves. In middle and high school I read all of the books multiple times. As in- I have passages memorized, I know I’ve read the 4th one over 10 times. BUT- I have only read book 7 once (probably since it came out right before I started college), so listening again is fun since I can’t remember every single detail as well as I do with the other books in the series. Listening to this while sewing Etsy items makes time fly. 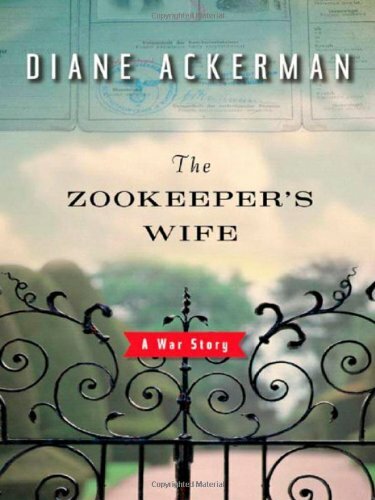 And finally the last book I’m working through is The Zookeeper’s Wife by Diane Ackerman. It fits with my accidental WWII reading theme for the year. This one is super short compared to the rest of the books in this post, but I’m going through it slowly. I need to have it finished for book club by next week! Looks like I’ll have to put down my fiction for a few days to finish.